After being sick, we wanted a feel better meal. 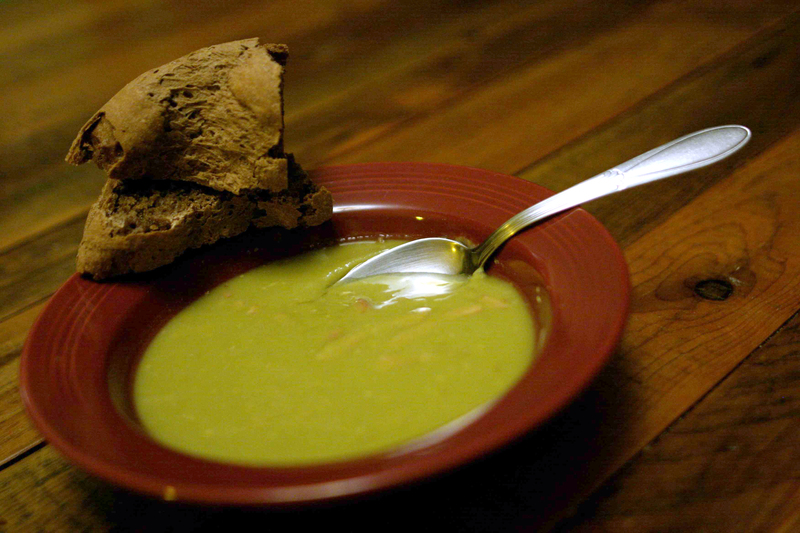 Both hubby and I love and crave a simple split pea soup. It is about -2°F outside and it has been a perfect week to let a Russian black bread rise by the fire place. On my crockpot I add all ingredients and cook on high for 4 hours. For a stove top version, bring to a boil until vegetable are soft then reduce heat to a simmer for about one hour, stirring occasionally. Add water if needed. I use a whisk to make the soup smooth before serving. For the Pressure cooker, add all the ingredients to the pot. To be safe, I always make sure there are 2 inches of liquid above the food and the pot does not exceed the 2/3 full level, not to clog the vent. When the weighted-jiggle top starts to rock, or when the pressure-release valve starts to make a hissing noise, time about 7-8 minutes. Release pressure according to manufacture directions or let steam scape. Open, stir and serve.